Irving Resources Samples High-Grade… | Irving Resources Inc.
Vancouver, British Columbia, October 19, 2018 (Globe Newswire) – Irving Resources Inc. (CSE:IRV) (“Irving” or the “Company”) is pleased to report it has sampled high-grade quartz vein float at its 100%-controlled Omu gold-silver project, Hokkaido, Japan (Figures 1, 2 and 3). While following up stream sediment anomalies (please refer to Irving’s news release dated January 3, 2018 for further details), Irving geologists identified banded quartz vein and other pieces of mineralized float along recently constructed logging roads in areas around the historic Hokuryu mine. Logging roads often provide the only geologic exposure in this heavily vegetated terrain. Inquiries made by Irving with the Hokkaido prefectural forestry agency and local logging road constructors confirm no exotic material was placed on these roads and all road base material is locally derived. Therefore, Irving believes quartz vein float material reported in this news release is derived from nearby bedrock. In addition, Irving geologists collected seven samples of variably altered and silicified volcanic rock and breccia with gold values ranging from 0.14-0.53 gpt and silver values ranging from 3-19 gpt. 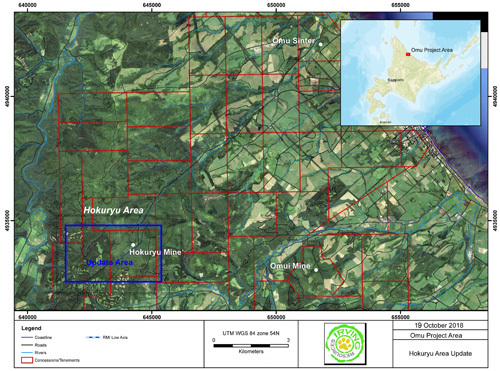 Irving believes the “West Hokuryu” area may host extensions of the Hokuryu vein system. Hokuryu mine, owned by Nihon Mining Company, Ltd., operated briefly beginning in around 1928 until it was shut in 1943 due to the Gold Mine Closure Act near the end of WWII. It produced approximately 2.8 tonnes Au and 11.5 tonnes Ag during its short life. (MMIJ. 1990. Japanese Gold Mines Vol. 2 Hokkaido. The Mining and Materials Processing Institute of Japan (MMIJ)). In an area approximately 2.5 km southwest of Hokuryu mine, a sample of quartz vein float returned 20.8 gpt Au and 59 gpt Ag and two samples of silicified and quartz-veined volcanic rock returned 1.78 and 0.68 gpt Au and 19 and 24 gpt Ag. One sample of quartz vein float collected approximately one km northeast of Hokuryu mine returned 7.14 gpt Au and 41 gpt Ag. Six samples of variably silicified and quartz-veined volcanic rocks from areas north, northeast and east of Hokuryu mine returned 0.03-2.50 gpt Au and 0.5-57 gpt Ag. Samples discussed above are of select float and not necessarily representative of mineralization in this area. Irving is currently conducting further prospecting in vicinities around Hokuryu mine and to the north where there are historic reports of high-grade veins. 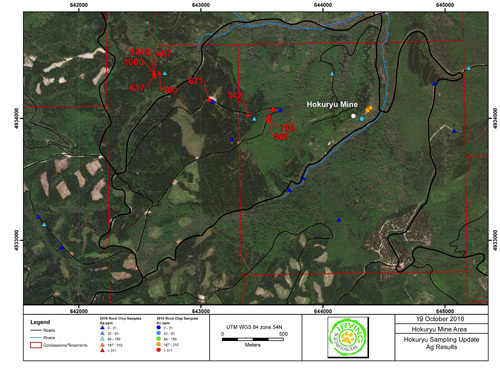 Follow-up soil sampling and geophysical work is currently being planned at Hokuryu West. Irving recently signed a diamond drilling contract with Rodren Drilling Ltd., Winnipeg, Manitoba (“Rodren”), to undertake diamond drilling at its Omu project. A diamond drill is currently being mobilized to Hokkaido and is expected to reach Omu in approximately two weeks. Although necessary permits are still awaited, Irving, Mitsui Mineral Development Engineering Co., Ltd. (MINDECO) and Rodren are concurrently working on necessary staffing for a drill program. Further information about timing of commencement of drilling will be made available when more information is in hand. All samples discussed in this news release were collected by Irving geologists from float, loose rock in soil, believed derived from subcropping bedrock and veins. They are not necessarily representative. Irving submitted rock samples to ALS Laboratory, Vancouver, BC, for analysis. Au and Ag were analyzed by fire assay with gravimetric finish. Multielements were analyzed by mass spectrometry following three acid digestion. Lab standard and blank samples were utilized for quality assurance and control.